First, we take the rod and run it through our automated stud cutter. This cuts the rod to the desired length. After this the studs go to the chamfer machine, which alters the ends of the threaded rod so that a nut may be screwed onto it. Lastly, the stud is stamped with the type material it is along with our principle trademark, which is an "S" over a diamond. 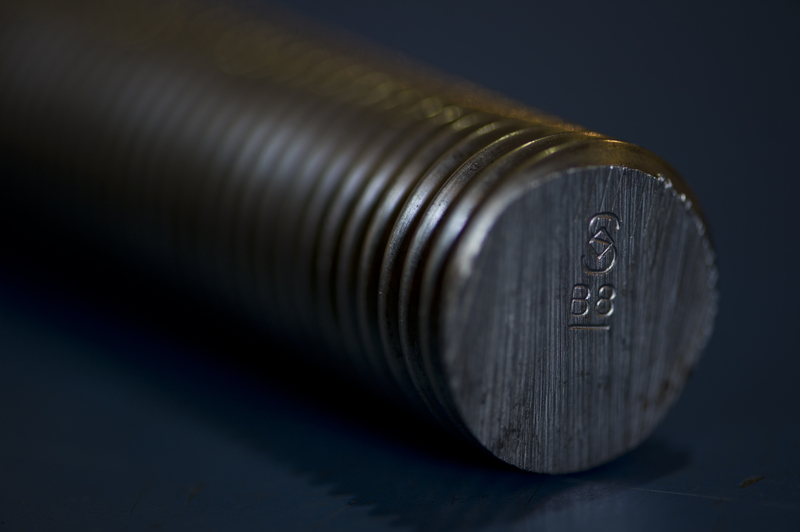 We're able to do this with A193 B7, B8, B8M, B8 CL2, B8M CL2, and B16 threaded rod that we stock along with a few more obscure grades as well. So ask us, we can source it for you. All the original rod is lot tracked. This means we have the paperwork detailing where it was formed and forged and if we cut the studs from it, the lot tracking carries over. So you know excactly what you're getting. We are the only fastener supplier in the Augusta Georgia area to offer this service in house. We find it to be invaluable to our customers during shutdowns whether planned or unplanned. We have around the clock after hours service if your needs fall outside of regular working hours. So give us a try during your next planned outage or even your next non planned emergency. We'll get it done.